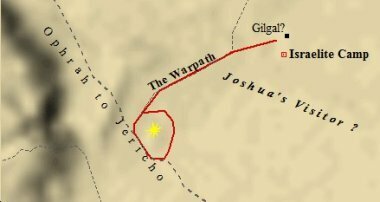 The Biblical account of the battle of Jericho begins in Joshua chapter 2, when Joshua sends out spies into ancient Jericho. The Bible says that Joshua and the Israelites were encamped at Shittim, and the spies were sent out from this town. Shittim lies approximately 10 miles (16km) east of the River Jordan, and approximately 15 miles (24km) east of Jericho. The Bible lists the fighting men of Israel at 40,000 (Josh. 4:13). 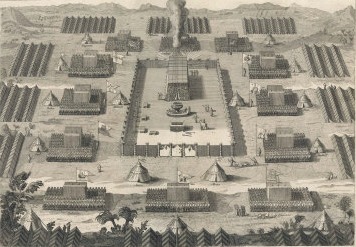 However, the number of troops involved in the battle of Jericho is another controversy. This controversy centers around the Hebrew word Eleph, which is usually translated as "thousand". However, the word has had a number of different meanings and uses throughout its history. ELEPH was originally connected to "head of cattle", signifying its application to denote a unit. In the sense of a head of cattle, eleph signifies a population unit important to an agricultural based society. ELEPH was also used to describe the quota of men a village, or clan, was required to produce for the military. Originally this quota was a very small number, and ELEPH was used to denote that number of men required. Finally, the word evolved into a technical term used to describe a military unit of significant size. 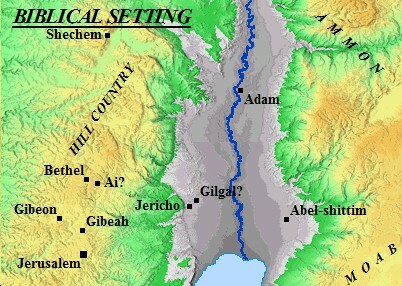 A map of ancient Jericho and its neighboring cities. 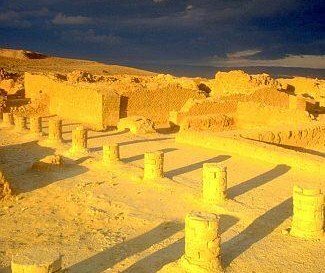 Jericho is one of the most ancient cities in the world, possessing a natural water source in a region where water is scarce. Concerning the battle of Jericho, the word ELEPH is translated as "thousand". This leads to the number of 40,000 fighting men. Critics of this interpretation claim it should be translated as a military unit, which though significant in size was not literally 40,000 fighting men. If the number 40,000 fighting men is taken as the original intent of the author, then the number of Israelites coming out of Egypt would have numbered between 2 million to 2.5 million men, women, and children. This would have not counted the amount of livestock and other people of different nations not included among the number of Israelites. Exodus makes it clear it was a mixed multitude that left Egypt - though overwhelmingly Israelite in nature, and an Israelite event. Some of these men from the mixed multitude would have participated on the Israelite side in the battle of Jericho. However, if one allows for an error in copying, and a misinterpretation of the word ELEPH, then the number of fighting men in Israel and the population of ancient Israel itsel is more manageable. Regardless, the battle of Jericho involved thousands of people. Without going into great detail, proponents of this mistranslated/misinterpreted meaning of ELEPH theory have estimated the number of fighting men in Israel was actually 5,000 to 8,000 men. Following this line of thought, the total population at the battle of Jericho is numbered from 20,000 to 40,000 men, women, and children - Israelites only. Evidence suggests that the Exodus was a heterogeneous mix of peoples, as mentioned above. People not of Israelite blood would not have been counted among the Israelites, though they were part of the group. Rahab and her household became part of this group. The actual number of people traveling, thus, would have been larger than just the number of Israelites. The ancient remains of King Herod's palace in Jericho - the ancient City of the Palms. The number in the thousands, rather than millions seems to fit ancient records of other countries. For example, at the height of the Egyptian empire the standing ancient Egyptian army numbered 20,000 fighting men. Yet, one could counter this argument with the argument that Pharaoh would not have feared 8,000 fighting slaves nearly as much as millions of rapidly producing slaves. In any case, the King of Jericho would have noticed the mass of people encamped opposite the Jordan. Jericho exerted a mighty influence in the region. 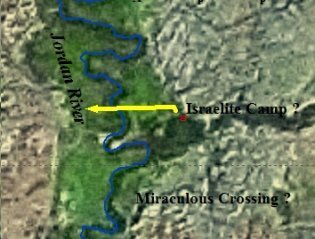 This influence would have easily spread the approximately 15 or so miles eastward across the Jordan River to where the Israelite camp was situated; and eastward from there into the plains of Moab. As the marauding Israelite nation approached Jericho, word would have traveled ahead of them warning of their imminent arrival. Rumors of their previous miraculous victories would've spread quickly through the Ancient Near East. Peoples from miles around would have fled to the city of Jericho for protection from these mysterious people and their powerful, yet invisible, God. The imminent battle of Jericho loomed over the region like a storm cloud. 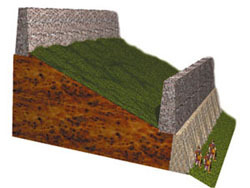 This is a computerized image of a cross-section of the walls of Jericho as they were formed. The earthen ramparts lead to brick walls, in different stages. Though small in diameter Jericho possessed extremely heavy fortifications and could have easily survived a siege of one year or more. Local village residents fared a much better chance of survival by fleeing to the protection found behind the walls of Jericho. The battle of Jericho would have influenced the entire region's economy and political stability. It lie at the doorway to Canaan, and it is most certain the Canaanite kings were taking notice. Like any good commander, Joshua first sought information on his target. As he had been one of Moses' spies into Canaan decades earlier, Joshua was well-trained in the art of intelligence gathering. He organized spies to scout Jericho's defenses. As the spies stealthily crept into ancient Jericho, they entered the house of a prostitute named Rahab (2:1). Jericho apparently possessed keen counter-intelligence operatives. Scripture reveals the king of Jericho became aware of the spies presence at Rahab's house. Scripture is silent as to how the king of Jericho became aware of their presence, but he sought to capture them and certainly torture them for intelligence before killing them. Joshua's spies left Shittim and crossed the Jordan, stealthily creeping into Jericho. He takes some of his men and confronts Rahab as to the Israelite spies whereabouts. "But the woman had taken the two men and hidden them, and she said, 'Yes, the men came to me, but I did not know where they were from. And it came about, when it was time to shut the gate, at dark, that the men went out; I do not know where the men went. Pursue them quickly, for you will overtake them." Rahab reported that the men had left before the city gates had closed, and then sent the King and his men on a wild goose chase. In truth, she had hid them on the roof of her house (2:2-7). Rahab seemed to sense the outcome of the pending battle of Jericho in advance. She chose to side with the Israelite spies, certain Israel would gain victory despite Jericho's massive walls and impressive ability to withstand sieges. After she deceived the King, Rahab retrieved the spies and pleaded with them to spare her and her family in the upcoming battle of Jericho. The two spies agree to her request. "So she let them down by a rope through the window, for the house she lived in was part of the city wall." The spies then returned to Joshua and reported all that had happened. Joshua, satisfied with their report, moved the Israelite camp from Shittim to the edge of the Jordan River, where they encamped before crossing (3:1). The Bible tells us they spent 3 days at this campsite before the battle of Jericho. Joshua received more instruction from the Lord in regards to the impending invasion and how it would occur. He sent the officers throughout the camp instructing the people as to what was about to happen. "When you see the ark of the covenant of the Lord your God, and the priests, who are Levites , carrying it, you are to move out from your positions and follow it. Then you will know which way to go, since you have never been this way before. But keep a distance of about a thousand yards between you and the ark; do not go near it." The power of the Ark of the Covenant is depicted when Joshua warned the people to stay "1,000 yards", or over 1/2 mile (900m), behind it! After the 3rd day, the Israelites set out to cross the Jordan. The Levites carried the ark ahead of the people per orders from the Lord. Joshua 3:15 states that the Jordan was at flood stage, as it remained so throughout the time of the harvest. This meant the waters were very high, nearly overflowing the banks, and moving rapidly. The Jordan River in this condition was deep and the water fast. Crossing on foot was nearly impossible and very dangerous. It would have been unthinkable for the young and elderly. As the Ark of the Covenant and the priests carrying it touched the fast-moving and flood-high waters of the Jordan River, God provided a miracle which would have been visible to everybody in the region. "that the waters which were flowing down from above stood and rose up in one heap, a great distance away at Adam, the city that is beside Zarethan; and those which were flowing down toward the sea of the Arabah, the Salt Sea, were completely cut off. So the people crossed opposite Jericho." Much like He did with the Red (or Reed) Sea out of Egypt, God again stopped the waters for His people. Outside of the walls of Jericho and on the eastern banks of the Jordan River God demonstrated to the entire nation of Israel (and Jericho) that He was with Joshua, just as He had been with Moses. The high and fast flood waters of the Jordan River, impassable to man, mattered not to Yahweh. He simply stopped them up. Imagine the shock from within the city of Jericho as they witnessed the Jordan River stop flowing and the waters gathering into a large heap several miles away. If nature was no match for this powerful Israelite God, then Jericho's massive walls would provide no protection either. As the hearts of Israel rose up in gratitude, the hearts of Jericho melted in fear. After Israel crossed the muddied river bottom of the Jordan, Joshua chose twelve men to erect twelve stones in the middle of the river bottom to memorialize the event. The twelve stones apparently stood for quite some time afterward as a sign of God's provision. Once Joshua had finished the monument, God gave him further orders. The Israelites pitched camp and the men were circumcised. God had tested them, and their obedience led God to "roll away the reproach of Egypt" (5:9), a consequence of the previous generation's disobedience in the desert. The Israelites were circumcised at "Gibeath-haaraloth", or, "the hill of foreskins". God's people were now in full compliance with His decrees. They were sanctified and in accordance with the Law. They were now ready for battle. The place became known as Gilgal; "on the eastern border of Jericho. (4:19)". In Joshua 5:10-12 the Israelites celebrated the Passover - just as they did on the eve of leaving Egypt four decades earlier. An overview of the Battle of Jericho. Israel moved camp from Shittim to Gilgal, outside of Jericho. They then marched on the city for seven days. The Bible tells us on the fourteenth day of the month they celebrated the Passover. Their celebration must have seemed eerily strange from on top the towering walls of Jericho. Why would this nation try to topple such massive and impenetrable walls? On the fifteenth day, Israel ate from the land of Canaan. On the sixteenth day, for the first time in forty years, the manna did not appear. God had cut off the provision of manna for now they ate "of the produce of the land of Canaan". As God had delivered them out of the land of Egypt, He was now going to deliver them into the land of Canaan. Joshua 5:13-15 records an interesting encounter. The Bible doesn't say what Joshua was doing. We are told he was "near Jericho", and nothing more. Perhaps he had finished walking through camp, checking on the people and supplies. He was aware the battle of Jericho was days, if not hours, away and wanted to make last minute preparations. Perhaps he was scouting the countryside, looking for patrols or weaknesses in the city's defense. Maybe he had been scouting for potential ambush sites. Maybe Joshua had been in prayer with the Lord. YAHWEH'S strategy was the key to victory in the battle of Jericho. Suddenly a soldier appeared in front of Joshua. The appearance of this warrior was sudden and must've caught Joshua off-guard. Joshua did not recognize the man's uniform as either one of his or that of the enemy. He only knew the mystery warrior had a drawn sword in his hand. It is interesting that Joshua's reaction was not one of alarm, but rather curiosity. He asked the sudden visitor which side he was on. The soldier answered, "Neither..". He was the commander of the army of the Lord, perhaps suggestive of the archangel Michael. 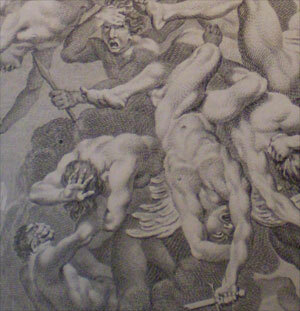 The Battle of Heaven as depicted in Paradise Lost by John Milton. The archangel Michael likely played a key role in that most ancient of battles. Why would Michael be a strong candidate for the identity of this angel-warrior? Jude 9 mentions that the archangel Michael had disputed with the devil himself over the body of Moses. That was probably not the first time Michael and Lucifer had squared off against each other. Michael is also mentioned in Daniel 10:13,21 & 12:1 as the prince of Israel who stands against forces of evil on behalf of Israel. Michael is also associated with Christ's second coming in 1 Thess. 4:16. It is also Michael who battles the fallen Watchers in the book of Enoch , again per God's divine instructions. The archangel Michael, according to Daniel 12:1, is "the great prince who stands guard over the sons of your people". He is the Protector of Israel. Leading the Israelites in the battle of Jericho would certainly fit a mission Michael would be assigned. Michael's sole concern are his orders from God. The battle of Jericho is not man's fight, but God's. Thus Michael was right in his words to Joshua. He stood not for Israel nor for Jericho - but for God Almighty only. In fact, it is not too presumptuous, based on the Biblical evidence and context, to presume Michael would've led the entire invasion of Canaan on behalf of Yahweh. The Lord then commanded Joshua as to the mechanics of the invasion. The "armed guard" (6:9) was to march first in line. They were followed by seven priests, carrying "trumpets of rams' horns" (6:4). These trumpets were blown continuously throughout the march around the walls of Jericho. The priests responsible for the ark of the covenant followed behind, with the "rear guard" (6:9) behind them. The battle of Jericho was a very structured invasion, and Joshua must follow precisely God's detailed orders. Scripture is not exactly clear as to the rest of the procession, but it is common belief the rest of the Israelites fell in behind the rear guard Joshua was very precise in his instructions to the Israelites, just as God had been precise with him. Their role in the battle of Jericho was to march in procession once around the city, one time per day. They were to do this for six consecutive days, with the trumpets blowing continuously as they marched. The seventh day would be different. Joshua instructed the people to march in silence. "Do not give a war cry, do not raise your voices, do not say a word until the day I tell you to shout. Then shout!" Joshua had been very clear in his earlier instructions. After the seventh time they marched around the walls of Jericho, after the trumpet blasted, only then would Joshua give the order, and only then were the people to give a war cry. God would then tumble the walls of Jericho and give the city to His people. It was as simple as that. The battle of Jericho was to be God's battle all the way. All He required was faithful obedience. Joshua issued orders that nothing was to be touched, or taken, except the things that had been devoted to the Lord. All people, men, women and children, young, and old, were to be killed. A map detailing Joshua's movements in the Battle of Jericho. Israel marched from their camp outside of the city to Jericho, and then marched around the city seven times before the walls fell. The silver, gold, bronze and iron were to go into the Lord's treasury. The devastation was to be complete. Only Rahab and all who were under her roof were to be spared. On the seventh day, after the seventh time around the walls of Jericho, Joshua gave the command and the Israelites gave a shout. The Bible says, "the wall fell down flat" . The Hebrew suggests that the city walls of Jericho fell beneath themselves. The walls of Jericho fall upon themselves. In fact, excavations have shown that the bricks from the collapsed walls of Jericho formed a ramp against the retaining wall. The Israelites simply; "went up into the city, every man before himself" (6:20). The destruction following the battle of Jericho was complete. The Israelite army destroyed every living thing. They killed every man, woman and child. They burnt the entire city, save for the Lord's treasure. They displayed their extraordinary discipline as a complete army. For an army to completely destroy Jericho as Israel did requires remarkable coherence and synchronization. Israel possessed a well trained, highly disciplined, and fast attacking army. The battle of Jericho was completely one-sided. "And they utterly destroyed everything in the city, both mand and woman, young and old, and ox and sheep and donkey, with the edge of the sword." In Joshua 6:24, they complete the destruction by burning Jericho. "And they burned the city with fire, and all that was in it. Only the silver and gold and articles of bronze and iron, they put into the treasury of the house of the Lord." To conclude the decisive battle of Jericho, Joshua cast a curse on the ancient city in the waning verses of chapter 6. This curse concluded the Biblical account of Jericho's role in the conquest of the Promised Land. "Cursed before the Lord is the man who rises up and builds this city Jericho; with the loss of his first-born he shall lay its foundation, and with the loss of his youngest son he shall set up its gates."